Industrial Spark-Proof Room (ISPR) from Standard Tools and Equipment Co. Many industries work with hazardous solvents that expose workers and facilities to hazardous and dangerous working conditions. Industries such as chemical, electronics, pharmaceutical, and various industrial processes have explosive environments that require the equipment to be specially constructed to minimize the risk of gas or dust ignition. The industrial spark-proof room (ISPR) from Standard Tools and Equipment is a ventilated and controlled environment for working with highly flammable and dangerous materials. Codes are written and enforced to keep you as safe as possible when working with dangerous materials. Our ISPR is designed to meet National Fire Protection Association (NFPA) and the International Fire Code (IFC) standards. Our industrial spark-proof room is a class I, division 2 workspace. Class I location indicates that flammable gases or vapors may or may not be in sufficient quantities to produce explosive or ignitable mixtures. Division 2 indicates that the hazardous material has a high probability of producing an explosive or ignitable mixture due to it being present. All electrical wiring is specified to be Class I Division 2 wiring method as per NFPA-70 or National Electric Code chapter 500. The lights in the ISPR are accessible from the inside and are rated for hazardous use. As a safety feature, lights automatically shutoff when light panel lense is opened. The fan is spark-resistant and the motor is fully-enclosed. The ISPR comes with an electrical control panel that must be 5’ from the booth, and wired with rigid conduit. The exhaust fan is of nonferrous construction and operates continuously at a lower CFM rating with the motor carrying a hazardous location label. The ISPR is not designed for applying paint. A fire suppression system is available at an additional cost, and recommended to be installed to the ISPR. Standard Tools and Equipment Co. is the manufacturer of the ISPR. There are basic model sizes offered, or it can be customized to fit your needs. · TEKS Screw construction. Easy assembly! · Made in USA. All components are from N. America. · Exhausts through the continuous direct-drive radial blower fan. 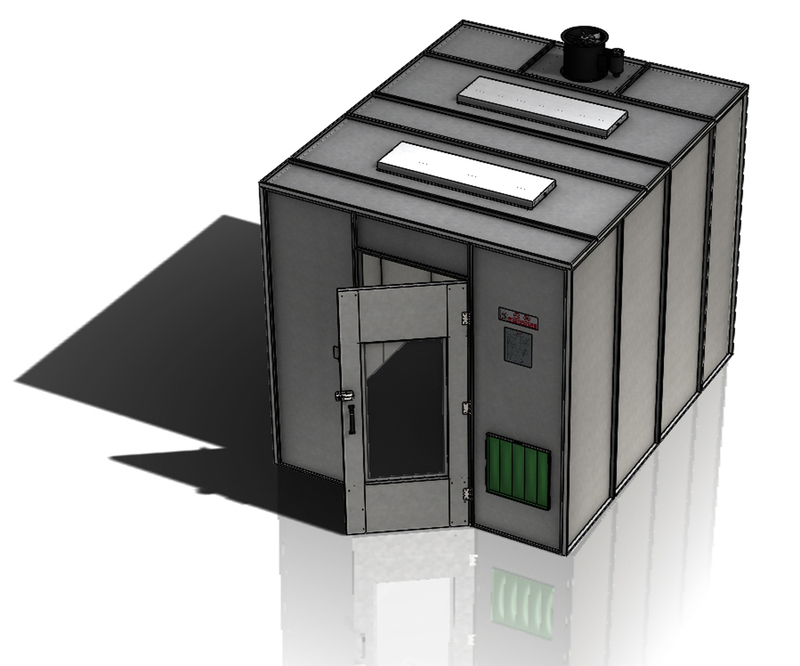 I am looking to see what would a 10×10 Explosion room would cost to construct here in Oregon. I am currently seeking a ballpark figure and nothing concrete. It would be used for hazardous materials as well. Let us know if you need additional information by giving us a call at 888-312-7488. Thanks! Previous Previous post: Buying a paint booth is easy … sort of. Next Next post: NEW! Heated Full Downdraft Booth.